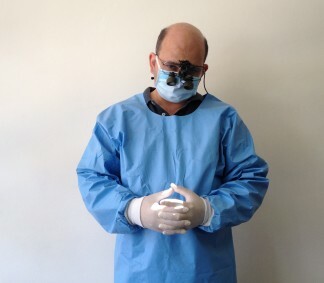 Infection control is also a vital part of keeping everything as sterile as possible. The gloves that are worn from the surgery to the sterilising room are discarded once there. A nurse is not allowed to wear the same gloves from the sterilising room and come back into the surgery, this stops cross contamination. The phone also is not to be answered with gloves on, even clean ones. 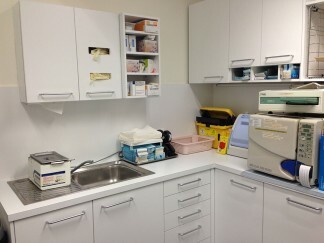 The gloves are to be worn only in the surgeries or in the sterilising room. A nurse is not allowed to walk into the waiting room with gloves on. Implant surgery is also another area where even stricter standards in sterilisation are required. We use sterile drapes for these surgical procedures. The dentist and nurses scrub up before covering themselves with sterile gowns and sterile gloves. The area where the procedure is taking place is scrubbed and disinfected with hospital grade disinfectants and then everything is covered. Foil that has been sterilised is wrapped around the handles of the light and x-ray unit. The suction is also covered with sterile plastic tubing and each code and barcodes are all tracked in the computer under the patients file. These are only a few things that are done in the busy life of a dental nurse.